Each dice board game listed on this page includes unique dice or a unique role for dice to play. These games include some type of playing surface with the game, not just dice and cards. It could be an actual game board or some interesting variation for a playing surface. Baseball fans and dice fans rejoice! 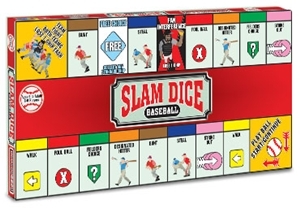 Slam Dice Baseball offers a fun baseball dice board game with custom dice for pitchers, hitters and fielders. The game also includes strategy chips and player pawns to create a game that combines strategy with skill and luck. The game can be played by as few as 2 players and as many as 8. The instructions offer both a basic game and an advanced game, which uses the strategy chips, but both apply the standard baseball rules for an authentic baseball experience. Are you ready for a heavy metal dice game? The Irondie game requires 9 custom metal dice for "attack", "defense" and "life". Your objective is to force your opponent to lose all of their dice through 3 phases, called "battle", "skirmish" and "damage assessment". Ready your army of dice for combat! You've got 4-sided, 6-sided and 8-sided dice at your disposal. The goal is to knock your opponent's dice off the board and into the gutter. Knockabout delivers a strategic "king of the hill" dice board game for 2 players. 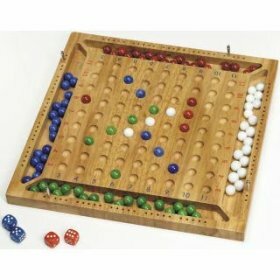 With 100 marbles, 6 dice and a stylish wooden game board, the Doubles Wild game will test your luck and skill. Your goal is to make rows of marbles on the board. The roll of the dice determine where you can place the marble. I guess the real question is this: Do you feel lucky? Good, because you're going to need it to win! Pardon me cowboy, but this Dice Town ain't big enough for the two of us. Get ready to show off your poker dice skills as you'll need to bet and bluff your way to prosperity. The game can be played by 2-5 people and includes the board, dice cups, 25 poker dice, game cards, gold nuggets (not real gold of course), and a Sheriff's badge among other goodies. Dust off your cowboy hat, pull on your boots and get ready to rustle up some fun. Watch the Dice Town YouTube video for a good overview of how to play this game. Its a space race to the center of the vortex with the Warp 6 dice board game. In this game, dice are both number generators and tokens to move on the board. 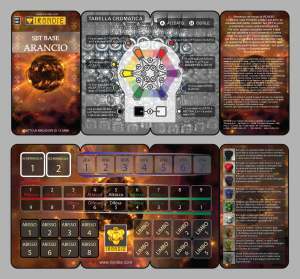 Warp 6 includes 18 dice of different colors and number of sides -- 4 sided, 6 sided or 8 sided -- and a felt game board to play upon. Find a way to land upon another ship and you can "warp down" a level of the vortex, bringing you closer to the center and closer to victory! Send your dice rolling down the tiered game board and score points based on how far they go. The game of Tumblin Dice is fast paced and fun. Each player takes turns playing with 4 dice. Your high scoring throw may not survive the entire round: Dice collisions occur often. The game board itself is quite large and does require assembly. However, it is easy to do and definitely a fair trade off for the hours of fun you'll have playing with friends and family. 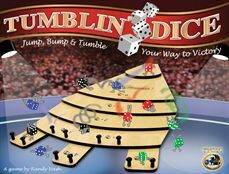 You can also check out a traveling version of the game, Tumblin Dice Jr.
Use dice to match shapes, colors or symbols to create "sets" on the game board. More sets equals more points! The game board resembles Scrabble slightly, but you're not spelling words. SET CUBED originated from the SET Card Game, but I like it better because it uses dice (of course)! Put your thinking cap on and get ready for a challenging dice board game. SAIKORO delivers an intriguing strategy game with 62 randomly arranged dice on a game board. The goal is to trap your opponent so that he/she cannot make a legal move. Sounds like fun to me! Speed + accuracy = victory. Can you roll the dice and make it around the board before your opponent? That's the challenge issued to you in the Zip! Dice Game. Roll the dice and make a match. Can't do it? Well, that's when the fun really begins in the Battle of the Sixes Dice Game. On your mark, get set....ROLL! Here's a spin-off on the fast paced Ligretto Card Game. The game was announced at the 2010 New York Toy Fair and should be available for purchase in the United States soon. In Ligretto Dice, your objective is to get rid of all your dice. Roll the dice and match your number and dice color to the appropriate square on the game board. Speed wins, but luck rules in this dice board game. Your goal is to get your 4 dice to the finish line first. You'd better have Lady Luck in the driver's seat if you want to win the game of Too Bad. Here's an enjoyable strategy game for the whole family. Tri-Cross compels you to hide your game pieces (dice), challenge the other players and capture their pieces to try and control the board. The classic Pop-O-Matic game gets a makeover with a Star Wars theme. In this version, you'll play as Sith, Jedi or Droid as you try to capture or rescue R2D2. The Star Wars R2D2 Trouble Game features those mystical dice in the bubble, that fascinate young and old alike. Please visit again! Use the RSS feeds to get alerted to new changes on this page. Use the buttons below to share this site with friends too. Happy Gaming!